How do I renew my Oregon contractor license? Detroit may finally be having its renaissance. Buildings and empty lots are being transformed all over the city; some are restored to their former glory, while others are demolished to make room for new builds and community gardens. The city has seen an influx of new restaurants and housing. All of which are clear signs of growth. Detroit’s current economic upswing combined with a plethora of affordable space is allowing Detroit real estate agency, Bedrock, to begin work transforming a two-acre lot in downtown Detroit. New York architecture firm SHoP Associates and Detroit-based architecture firm Hamilton Anderson Associates have designed a 2-acre building with 1.2 million square feet of space. 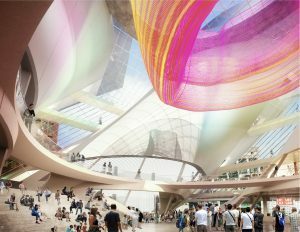 The site will include 250 residential units, more than 700 underground parking spaces, a conference hall, retail space, and a tech/arts/ cultural center. 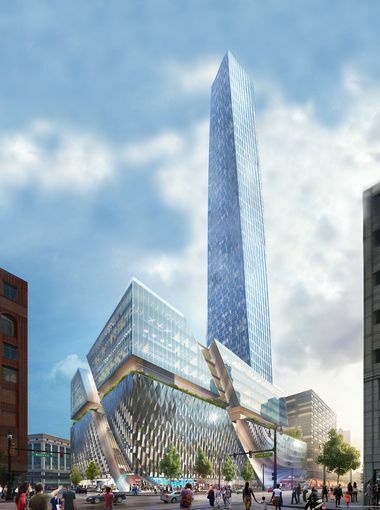 The building will be nine stories at the base with a 734-foot residential tower, making it the tallest in the Detroit. The site was once home to one of Detroit’s largest retailers, J.L. Hudson’s Department Store. At over two million square feet, it was the anchor of the thriving Woodward avenue shopping corridor. The store closed in 1983 and the building was imploded in 1998. Since then the lot has been vacant. 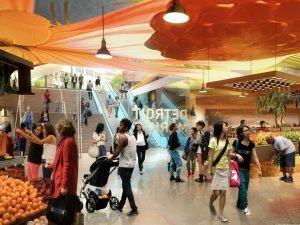 Bedrock believes the new project will bring even more commerce and vitality to downtown Detroit than J.L. Hudson’s. This entry was posted in Architecture and tagged Architects, new build.